22/Nov/2016 Posted By admin no comments. Is your Dev-ops or Infrastructure management team looking for options for cloud cost optimization and save time by eliminating human errors and the need for dedicated resources (like a standalone server) executing all tasks? Look no further! Automating AMI backups and cleanups using AWS Lambda helps you solve the above predicament to the T. We’ve seen it put to good use, and though we’ll bring it to you in this step-by-step guide. So, let’s get started! As Wikipedia says, AWS Lambda is an event-driven, serverless computing platform provided by Amazon Web Services. Introduced in 2014, AWS Lambda simplifies the process of building smaller, on-demand applications that are responsive to events and new information. It runs code in response to events and automatically manages to compute resources required by the code. You can start a Lambda instance within milliseconds! To top it all, it supports Node.js, Python, and Java, as of 2016. Why do I need AMI Backups and Cleanups? AMI makes it easier and faster to recover an instance in case of a disaster or failure of the instance, and therefore, automating this process is the way to go. Let’s now take a closer look at each of them with some demos and screenshots to make it easier. Login to your AWS Management console, Go to Services, and click on IAM under Security & Identity. 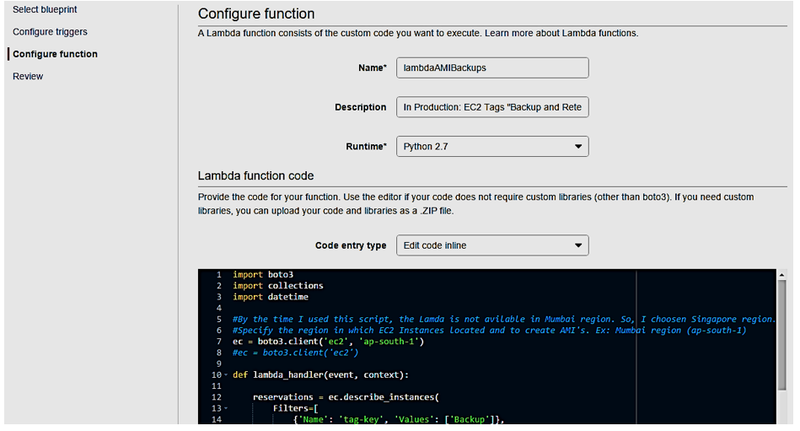 In IAM Dashboard, Click on Roles, and Create New Role with the Role Name: lamda-ec2-ami-role. Under AWS Service Roles, select AWS Lambda as the Role Type and then proceed to create a role. Go to Policies tab, click Create Policy and select Create your own policy (you can name the policy as lamda-ec2-ami-policy). Paste the content of the following JSON in Policy Document, and click on Create Policy. Select the created policy, click on Policy Actions and Attach to select the role already created - lamda-ec2-ami-role and click on Attach Policy. Now that we have created a role and a policy, we’ll have to create the first function that allows us to backup every instance in our account, which has a "Backup" key tag. We don’t have to indicate a value here. The script will first search for all ec2 instances having a tag with "Backup” on it. As soon as it has the instances list, it loops through each instance and then creates an AMI of it. 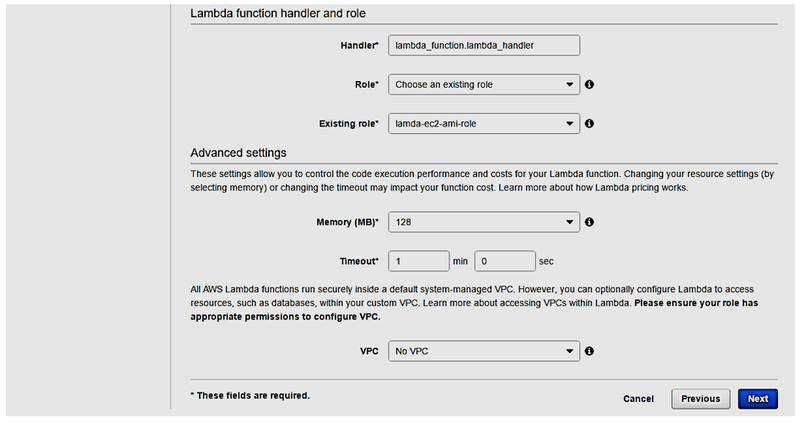 While creating lambda function, make sure to choose the IAM role created earlier (lamda-ec2-ami-role) and have specified sufficient memory and timeout configurations. The script first searches for all ec2 instances having a tag with "Backup” on it. As soon as it has the instances list, it loops through each instance and reference the AMIs of that instance. Note that the schedule time is shown in in UTC format – something like this: Lambda AMI Backup Function scheduled to run at 18:45 UTC or 12.15AM IST and Lambda AMI Cleanup Function scheduled to run at 19:30 UTC or 12.45AM IST every day. Having created AMI backup and cleanup functions and scheduling them, now it’s time to create a tag for the EC2 instance with a tag-key Backup with no value and Retention with retention days. Login to your AWS Management console, Go to Services, and click on EC2 under Compute. Select the Instance you want to tag (Linux-test, for example). Here, tag-key “Backup” is used to identify the instance for which the AMI has to be created and tag-key “Retention” with value “4” ensures that we retain AMI for 4 days and delete after 4 days. If the Retention tag is not used then, by default, it retains for 7 days. Now you can see the AMI created with tag-key “DeleteOn” with deletion date. That’s it! We’ve successfully used AWS Lambda to automate AMI backups and cleanups. The process might look daunting at first, but I’m sure that this step-by-step guide would help keep it simple. Well, off-course. The process works very well for all standalone instances unless the instance terminates. In cases where you might have a load balancer serving many instances (different types of it), the tag attached to one instance may terminate for some reason, therefore, not creating the AMI. However, there’s a workaround using ELBs. It fetches all the load balancers with pre-defined tags (Backup for example), puts them in an array and passes them through a loop, before picking one instance attached to it, to create the AMI. There is a whole lot more in our forthcoming blogpost, but until then, please keep the comments and feedback coming!